Do you suffer from teeth that are severely decayed, cracked, or even missing altogether? Here in Silver Lake and Topeka, our team wants to help you regain your full and healthy smile, and we can do so by providing custom-made crowns and bridges. Our dentists at Michel Dental look forward to welcoming you in! Why Choose Michel Dental for Dental Crowns & Bridges? When it comes to crowns, our office can use several different restorative materials, including precious metals, porcelain that’s fused to metal, or complete porcelain. Our recommendation for your crown will depend on several factors, but in most cases, an all-ceramic crown is best because of its natural aesthetic quality. We’ll match your new restoration to your natural tooth’s color for a virtually seamless result. 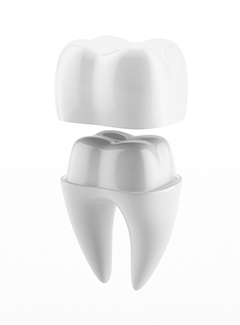 These crowns are also strong and durable, making them popular with all of our patients. In most cases, our team is able to provide patients with custom-made dental crowns in just a few short appointments, and once the final restoration is placed, it’s important for you to treat it just like you would a natural tooth with diligent brushing and flossing. Have you lost one or more teeth in a row? A dental bridge can be created to fill this gap, restore your complete smile, improve your ability to chew and speak clearly, and even give your face a more youthful appearance. 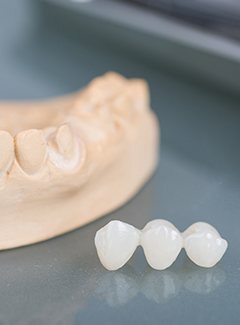 This prosthetic consists of lifelike false teeth and two crowns situated on either side that are designed to serve as “anchors,” securely holding the bridge in place over healthy adjacent teeth. If there are no healthy adjacent teeth, a dental implant could be used effectively instead, and if there are several missing teeth, an implant-retained prosthetic may be the better option. If cared for properly with regular check-ups and diligent homecare, your new bridge can last up to 10 years. Do you have any questions for our team about crowns or bridgework? If so, don’t hesitate to call! At Michel Dental, we love welcoming patients of all ages to our warm and friendly office environment. In addition to our Silver City and Topeka locations, we also serve the nearby areas of Manhattan, Lawrence, and beyond.